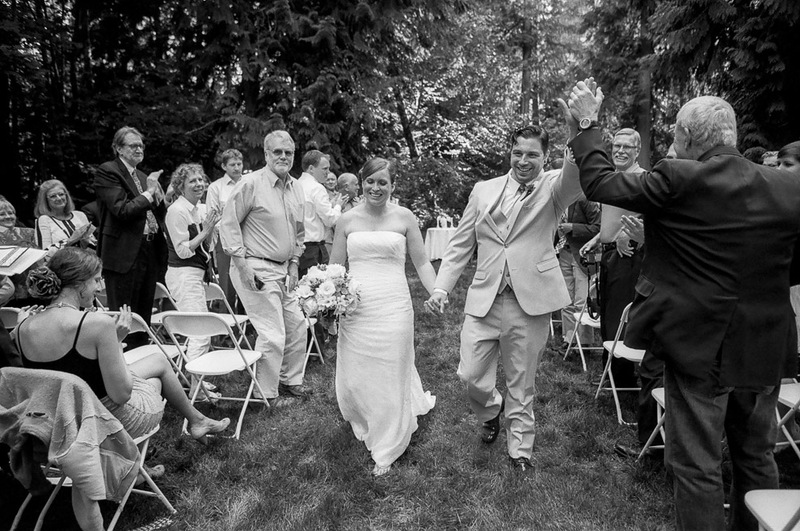 Paul and Megan were married in August in a forest clearing at Islandwood on Bainbridge Island, and I was there to photograph it for them in black and white film as they requested. It was a wonderful day and we were very happy shooting film again. Here are a couple of the pictures. Above Paul gives a high 5 and below is everyone at the wedding in a panoramic wedding portrait. This entry was posted on Saturday, October 5th, 2013 at 11:58 am	and is filed under LARGE GROUP PORTRAITS, LOVE, PANORAMA, WEDDINGS and tagged with black and white photography, panoramas, Wedding Photography. You can follow any responses to this entry through the RSS 2.0 feed.